New correct design dash metal assembly for your Nova. Exact fit for all 69, 70, 71 & 72 models without air conditioning. Includes dash top panel towards your windshield, glove box and ash tray areas, and lower brace under the plastic gauge carrier. Correct details and mounting points. New correct design dash metal assembly for your Nova. Exact fit for all 69, 70, 71 & 72 models with air conditioning. Includes dash top panel towards your windshield, glove box and ash tray areas, and lower brace under the plastic gauge carrier. Correct details and mounting points. New quality reproductions for 75, 76, 77, 78 & 79 Nova inner rear side panels with arm rests in correct injection molded plastic. Replace your damaged broken sun baked originals. Sold as a matched pair only. Comes black in color and can be painted if needed. This mirror has been designed with the goal of mixing style, elegance and functionality. Premium quality and made here in the U.S.A. Using 6061-T6 aluminum we crafted this mirror to out perform any original factory mirror with the amount of articulation, style and sophistication. 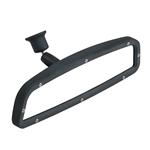 Designed with the concept of fitting every car, these mirrors feature a post that glues to your windshield and is assembled with CONVEX glass to give you a superior field of view. Perfect for your Camaro, Firebird, Chevelle, or Nova. This mirror has a flat matte finish. This is finest billet rear view mirror available on the market! This mirror has a gloss black finish. This mirror has been designed with the goal of mixing style, elegance and functionality. Premium quality and made here in the U.S.A. Using 6061-T6 aluminum we crafted this mirror to out perform any original factory mirror with the amount of articulation, style and sophistication. 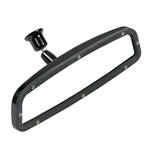 Designed with the concept of fitting every car, these mirrors feature CONVEX glass to give you a superior field of view and utilizes the original factory bracket, making it a perfect fit for your Camaro, Firebird, Chevelle, or Nova. Note: No mounting bracket is included with this mirror, It uses the existing factory mounting bracket. Super cool rear glass de-fog assembly. This rare option defogger option can be added to any 71 - 72 Chevelle & Nova model with ease. Tested and guaranteed. Mounts in your rear window package tray metal. Your car has the provision for this set already in the package tray area. The one you will receive will look similar to the one pictured. Top vent grille cover can be painted or dyed any interior color needed. Ready to go! This mirror has a brushed and polished two-tone finish. This mirror has a polished finish. 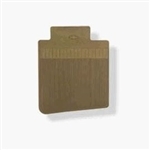 Correct floor mat set in Ivy Gold for 68, 1968, 69, 1969, 70, 1970, 71, 1971, 72, and 1972 Nova models. Includes exact ribbed design with bow tie logo embossed on both front and rear mats. Heavy rubber with no-slip grippers on the back. These OE style floor mats were originally available as an optional accessory. Each mat is die-cut to fit the Nova floor pan. If you've ever searched for the original GM early model accessory floor mats for your Nova, then you know how difficult they are to find! This original style floor mat set features a correctly embossed Bow Tie emblem on both front and rear mats. This superior quality set is manufactured with high grade rubber, original style grains and colors! Also includes the original type carpet grips on the bottom of each mat allowing the mats to adhere to the carpet and stay in place without sliding forward or from side to side. You won't be able to tell these beauties from the originals! Show car ready. Correct floor mat set in Dark Blue for 68, 1968, 69, 1969, 70, 1970, 71, 1971, 72, and 1972 Nova models. Includes exact ribbed design with bow tie logo embossed on both front and rear mats. Heavy rubber with no-slip grippers on the back. These OE style floor mats were originally available as an optional accessory. Each mat is die-cut to fit the Nova floor pan. If you've ever searched for the original GM early model accessory floor mats for your Nova, then you know how difficult they are to find! This original style floor mat set features a correctly embossed Bow Tie emblem on both front and rear mats. This superior quality set is manufactured with high grade rubber, original style grains and colors! Also includes the original type carpet grips on the bottom of each mat allowing the mats to adhere to the carpet and stay in place without sliding forward or from side to side. You won't be able to tell these beauties from the originals! Show car ready. Correct floor mat set in Gold for 68, 1968, 69, 1969, 70, 1970, 71, 1971, 72, and 1972 Nova models. Includes exact ribbed design with bow tie logo embossed on both front and rear mats. Heavy rubber with no-slip grippers on the back. These OE style floor mats were originally available as an optional accessory. Each mat is die-cut to fit the Nova floor pan. If you've ever searched for the original GM early model accessory floor mats for your Nova, then you know how difficult they are to find! This original style floor mat set features a correctly embossed Bow Tie emblem on both front and rear mats. This superior quality set is manufactured with high grade rubber, original style grains and colors! Also includes the original type carpet grips on the bottom of each mat allowing the mats to adhere to the carpet and stay in place without sliding forward or from side to side. You won't be able to tell these beauties from the originals! Show car ready. Correct floor mat set in Red for 68, 1968, 69, 1969, 70, 1970, 71, 1971, 72, and 1972 Nova models. Includes exact ribbed design with bow tie logo embossed on both front and rear mats. Heavy rubber with no-slip grippers on the back. These OE style floor mats were originally available as an optional accessory. Each mat is die-cut to fit the Nova floor pan. If you've ever searched for the original GM early model accessory floor mats for your Nova, then you know how difficult they are to find! This original style floor mat set features a correctly embossed Bow Tie emblem on both front and rear mats. This superior quality set is manufactured with high grade rubber, original style grains and colors! Also includes the original type carpet grips on the bottom of each mat allowing the mats to adhere to the carpet and stay in place without sliding forward or from side to side. You won't be able to tell these beauties from the originals! Show car ready. Correct floor mat set in Light Blue for 68, 1968, 69, 1969, 70, 1970, 71, 1971, 72, and 1972 Nova models. Includes exact ribbed design with bow tie logo embossed on both front and rear mats. Heavy rubber with no-slip grippers on the back. These OE style floor mats were originally available as an optional accessory. Each mat is die-cut to fit the Nova floor pan. If you've ever searched for the original GM early model accessory floor mats for your Nova, then you know how difficult they are to find! This original style floor mat set features a correctly embossed Bow Tie emblem on both front and rear mats. This superior quality set is manufactured with high grade rubber, original style grains and colors! Also includes the original type carpet grips on the bottom of each mat allowing the mats to adhere to the carpet and stay in place without sliding forward or from side to side. You won't be able to tell these beauties from the originals! Show car ready. Correct floor mat set in Medium Blue for 68, 1968, 69, 1969, 70, 1970, 71, 1971, 72, and 1972 Nova models. Includes exact ribbed design with bow tie logo embossed on both front and rear mats. Heavy rubber with no-slip grippers on the back. These OE style floor mats were originally available as an optional accessory. Each mat is die-cut to fit the Nova floor pan. If you've ever searched for the original GM early model accessory floor mats for your Nova, then you know how difficult they are to find! This original style floor mat set features a correctly embossed Bow Tie emblem on both front and rear mats. This superior quality set is manufactured with high grade rubber, original style grains and colors! Also includes the original type carpet grips on the bottom of each mat allowing the mats to adhere to the carpet and stay in place without sliding forward or from side to side. You won't be able to tell these beauties from the originals! Show car ready. Correct floor mat set in black for 68, 1968, 69, 1969, 70, 1970, 71, 1971, 72, and 1972 Nova models. Includes exact ribbed design with bow tie logo embossed on both front and rear mats. Heavy rubber with no-slip grippers on the back. These OE style floor mats were originally available as an optional accessory. Each mat is die-cut to fit the Nova floor pan. If you've ever searched for the original GM early model accessory floor mats for your Nova, then you know how difficult they are to find! This original style floor mat set features a correctly embossed Bow Tie emblem on both front and rear mats. This superior quality set is manufactured with high grade rubber, original style grains and colors! Also includes the original type carpet grips on the bottom of each mat allowing the mats to adhere to the carpet and stay in place without sliding forward or from side to side. You won't be able to tell these beauties from the originals! Show car ready. Correct floor mat set in Dark Green for 68, 1968, 69, 1969, 70, 1970, 71, 1971, 72, and 1972 Nova models. Includes exact ribbed design with bow tie logo embossed on both front and rear mats. Heavy rubber with no-slip grippers on the back. These OE style floor mats were originally available as an optional accessory. Each mat is die-cut to fit the Nova floor pan. If you've ever searched for the original GM early model accessory floor mats for your Nova, then you know how difficult they are to find! This original style floor mat set features a correctly embossed Bow Tie emblem on both front and rear mats. This superior quality set is manufactured with high grade rubber, original style grains and colors! Also includes the original type carpet grips on the bottom of each mat allowing the mats to adhere to the carpet and stay in place without sliding forward or from side to side. You won't be able to tell these beauties from the originals! Show car ready. New quality reproductions for 75, 76, 77, 78 & 79 Nova quarter window lower interior trim moldings in correct injection molded plastic. Mounts below the quarter window in the interior. Replace your damaged broken sun baked originals. Sold as a matched pair only. Comes black in color and can be painted if needed. New quality reproductions for 75, 76, 77, 78 & 79 Nova quarter window rear pillar trim moldings in correct injection molded plastic. Replace your damaged broken sun baked originals. Sold as a matched pair only. Comes black in color and can be painted if needed. New quality reproductions for 75, 76, 77, 78 & 79 Nova headliner side trim moldings in correct injection molded plastic. Replace your damaged broken sun baked originals. Sold as a matched pair only. Comes black in color and can be painted if needed. New quality reproductions for 75, 76, 77, 78 & 79 Nova quarter window post or B pillar trim moldings in correct injection molded plastic. Replace your damaged broken sun baked originals. Sold as a matched pair only. Comes black in color and can be painted if needed. New quality reproductions for 75, 76, 77, 78 & 79 Nova pillar post moldings in correct injection molded plastic. Replace your damaged broken sun baked originals. Sold as a matched pair only. Comes black in color and can be painted if needed. New 1968 - 1972 Nova Interior B Pillar Post Quarter Panels Moldings are now available! These are sold in a pair for both LH and RH sides. Fits all 1968, 1969, 1970, 1971, 1972 Nova models. These molding cover the quarter or "B" pillar which is the body post from the rear panel to the roof just in front of the quarter window. The high strength molded plastic is paintable , so there is no worry about matching your color scheme. Don't let a cracked or missing quarter pillar interior molding hold up your 68, 69, 70, 71, 72 Nova restoration. New custom chrome dome light assembly for your Chevelle or Nova. Dimensions are 4.5" x 2" x 0.75". Show chrome plating with a frosted lens. Includes wiring harness for easy connection. Looks super trick in any model. New quality reproductions for 75, 76, 77, 78 & 79 Nova shoulder seat belt retractor covers in correct injection molded plastic. Replace your damaged broken sun baked originals. Sold as a matched pair only. Comes black in color and can be painted if needed. New custom inner rear view mirror for your Chevelle or Nova. Works great for all 66 - 72 models. This new custom mirror features black pebble grain on the back side with black rubber outer edge. Even has the Day / Night flipper on the bottom. Order yours today!! New correct design power window switch for your Chevelle or Nova. Exact fit for all 64, 65, 66, 67, 68, 69, or 70 models with factory style power windows. Does right hand door glass and both rear quarter glasses. Exact rounded edges with heavy show chrome plating. Includes mounting retainer clip. Replaces original GM part number 4432790 perfectly. Excellent quality! Hog Rings and Premium Quality Pliers set for installing seat upholstery in your Nova. Correct for all models. Includes about 200 hog rings. Great kit for do it yourself projects like installing seat covers, Premium quality tool and hog ring set. 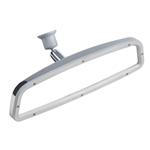 New sunvisor mounted vanity mirror for your Nova. Super easy to install just slide into place. Features Cool "Chevrolet" script at the top. Neat addition for and model. New interior trim screw kit for your Nova. Works great for all 68, 69, 70, 71, and 72 two door models. Includes 86 pieces. New Nova interior rear view mirror boot. Fits all 1968, 1969, 1970, 1971, 1972 Nova models. This molded rubber will cover the roof mirror mounting bracket. Black in color with correct hole locations. Can easily be painted or dyed, so there is no worry about matching your color scheme. Don't let a cracked or missing boot hold up your 68, 69, 70, 71, 72 Nova restoration. New Premium Quality Hog Ring Pliers with curved easy to grip handles and an Straight Head for easy install in your Nova. Spring loaded, makes it nice. Great tool for do it yourself projects like installing seat covers, Premium quality tool at a great price! New Premium Quality Hog Ring Pliers with curved easy to grip handles and an angled head for easy install in your Nova. Spring loaded, makes it nice. Great tool for do it yourself projects like installing seat covers, Premium quality tool at a great price! New custom billet door lock knobs for 68 - 72 Nova models. Raw finish is perfect. They just look great! Sold as a pair. Set of four clear knobs, retaining clips included. Fits all 66, 67, 68, 69, 70 71 ,72 Chevelle and 68, 69, 70, 71, 72 Nova models.